Fu Ying introduced <?xml:namespace prefix = st1 ns = "urn:schemas-microsoft-com:office:smarttags" />China's medical system reform. She denoted that UK is also carrying out National Health Service (NHS) reform. Both sides can learn from and draw on each other's strength. Fu Ying said that traditional Chinese medicine is a part of the excellent Chinese culture and has an important position in modern Chinese medical and health system. The Chinese government actively supports the development of traditional Chinese medicine and Chinese minorities' medicine and offers all-out support to international exchanges and cooperation concerning traditional Chinese medicine. In recent years, traditional Chinese medicine has developed rapidly in UK and attracts the attention of British Royal Family, public, enterprises and academia. However, there is a problem of how to ensure systematism and to supervise and monitor quality of overseas traditional Chinese medicine. 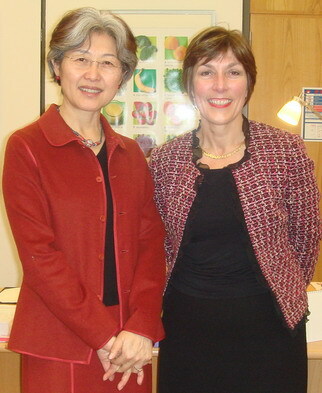 Fu Ying denoted that Chinese side plans to organize "Traditional Chinese Medicine Week" in "China Now" to be held in UK in 2008, so as to introduce traditional Chinese medicine to UK public in a complete, objective and concentrated way, and provide an opportunity for both countries to strengthen their cooperation in production, study and research of traditional Chinese medicine. it is hoped that the Department of Health could offer its assistance. Ms. Dawn Primarolo introduced current situations of UK NHS reform and said that UK government was considering incorporating acupuncture into NHS. Ms. Dawn Primarolo denoted that "Traditional Chinese Medicine Week" is a meaningful event and will help to improve the image of traditional Chinese medicine and enhance the cognition by UK public. the Department of Health will offer its active support to this event.